Could it be, we've unlocked the power of Thor with this Hammer Tool? Learn how to install this PowerPoint add-in we wish we'd found years ago! If you find your titles are drifting away from one slide to another, you'll love this tutorial for aligning objects between slides in PowerPoint. Way #1 takes less than 12 mins and Way #2 takes less than 30 secs. That's PowerPoint Speed Training at its best! Now that you've inserted your graphic, the formatting fun begins. Here are 5 (+a bonus) of my favorite Gantt Chart tricks in Office Timeline+. Don't know about add-ins or how to get them? Here's a list of our 8 favorite PowerPoint add-ins for productivity and why you need them. 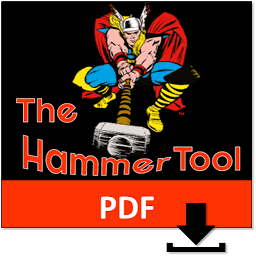 Where should I send you this Hammer Tool instructions PDF? Yes, it's 100% FREE. Sign up to our email newsletter to get immediate access to your PDF, and you'll also get the latest & greatest hacks for PowerPoint, sent to your inbox once or twice a week. 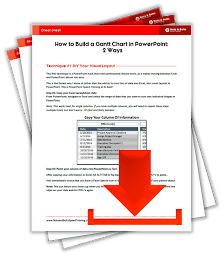 Download the PDF Cheat Sheet for How To Make A Gantt Chart in PowerPoint and see the 2 techniques for yourself.